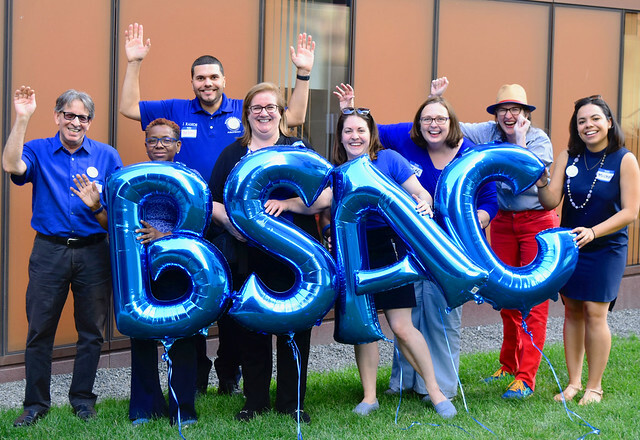 BSAC sponsors and cosponsors events throughout the year to promote staff appreciation, and create social opportunities for staff to get to know each other. Please watch this page for event announcements, which will also be communicated through email and flyers. All staff are invited to attend monthly informational sessions, where members of BSAC will be present to explain what we do and how you can join, as well as listen to any good news, ideas, or concerns. There's no need to RSVP for these events - please drop by any time within the hour. The next Talking Tuesday will be held on May 7, with more dates to come. SPRING SOCIAL: Friday, March 22, from 3:30-5:30pm in the Diana Center Event Oval. Barnard College staff attended a casual social event in March that featured catering from Jimmy's Cafe, a photobooth, and the musical stylings of DJ Juan Ramos, a Barnard Public Safety officer and BSAC representative. Barnard College staff attended a summer ice cream social to celebrate the end of summer and the beginning of a new school year. BSAC Co-Chairs Christine Shin and Dawn Williams gave brief remarks about the Council, and President Beilock thanked staff for all their efforts throughout her first year at Barnard. BSAC members and College senior staff dished out a variety of ice cream flavors, toppings, and dairy-free popsicles to more than 200 staff, with help from perfect summer weather and an upbeat soundtrack from "DJ Deejay" - HRIS Analyst Mike Malena.